Two letters: HD. 1080p High-Definition gaming has finally arrived on a Nintendo console to dramatic effect. If you're after graphics specs we're afraid there are none at this stage, but we've seen it first-hand and they're easily as powerful as the PS3 and Xbox 360. The Wii U runs on inbuilt flash memory and takes a proprietary optical disc format. That's about all we know at the moment. The Wii U is completely backwards compatible with the Wii. It'll happily play Wii games either from discs or downloaded from Nintendo, while the console will let you use up to four Wiimote and Nunchucks at once. In fact, the use of Wiimotes is set to feature highly in Nintendo's multiplayer plans. The display on the controller is a 6.2-inch touchscreen. It's not HD, nor does it boast the 3D tech found on the 3DS, although there was no reason as to why for either. What we can say is that it is extremely bright and vivid - easily something you'd be happy playing on for extended lengths of time. The touchscreen was responsive, too, but touchscreen aspects in the tech demos we played were few and far between. Just like the Wiimote before it, the new controller has full, 360-degree motion control that's incredibly responsive. It perhaps won't be as vital to gameplay as its forbearer, but it does add an extra layer of gameplay. Examples of its use can be to aim in shooting games, to be used as a 'shield' when lifted up to the TV screen or simply to move the camera around a 3D environment. The new controller forgoes the simplistic, NES style controls found on the Wiimote. Here we have the full compliment of buttons you expect to see on a modern console, ready for the kind of games that appeal to core gamers. Two thumbsticks - one either side of the screen - and four rear trigger buttons mean this controller is ready for franchises like Call of Duty and FIFA. The games we played and saw were all tech demos running on a dev kit. To read about the games we played, as well as the official titles heading to the console, check out our explanation of the tech demos, linked left. Nintendo confirmed that the Wii U will be able to download content. In the context it was mentioned, this meant games, both new and for the Wii, although we'd be surprised if the online connectivity ends there. Given the front facing camera we can see Skype-style conference calling being a strong possibility. 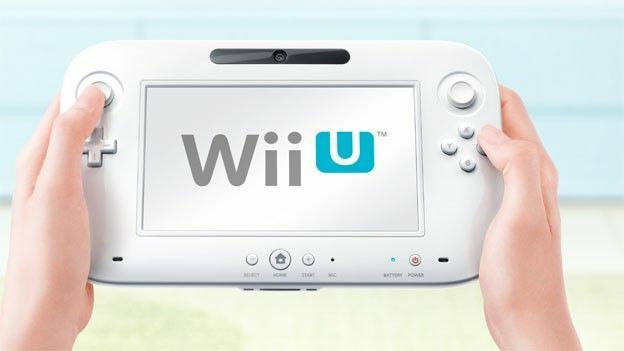 There's no water-tight date as yet, but Nintendo's Wii U is destined for the next fiscal year, which means somewhere between April 31st and December 31st in 2012. There's no word on price for either the console or additional controllers, but we'll keep you posted as and when we here more.